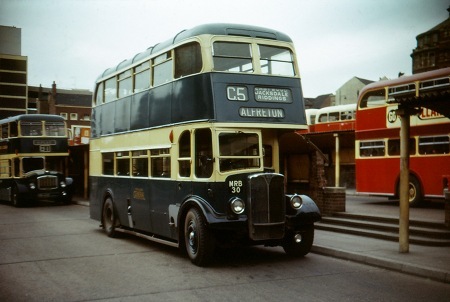 Photographed in Nottingham in August 1961 is Midland General 453, 972 ARA, a Bristol LD6G Lodekka with ECW H33/25RD bodywork, delivered to the operator in October 1956. 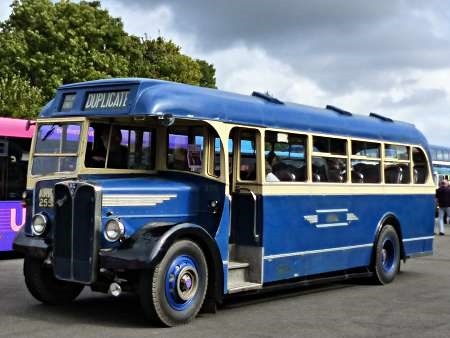 This vehicle, together with other buses from across the NBC, went to West Riding in April 1970 to expedite the withdrawal of the troublesome Guy Wulfrunian fleet. Sadly, 453 didn’t last very long in the care of West Riding as it went to the scrapyard in December 1971 having, rather pointlessly, been renumbered No. 408 just one month earlier. Such a pity the BTC had such a rigid livery policy with most Loddekkas being in wall to wall red or green. We were denied the opportunity to see such attractive vehicles in attractive liveries such as this one on a wider scale. The Midland General livery seemed to slip through the livery police net somehow but the loophole was soon spotted by the dreaded NBC and the even more dreaded poppy red was soon inflicted. I agree – the only other attractive exception was BH&D, who had cream roofs and a much deeper band of crew around the lower deck windows – oh, and I think that either Notts & Derby or Mansfield District did something similar with Tilling Green and cream. Pity as the ECW body was beautifully proportioned, although too Spartan inside for my taste. Some Midland General vehicles were initially painted dark blue with a white band and the fleetname in NBC style. Midland General never was a Tilling company but throughout it’s existence as a BTC and THC operator, it’s vehicles were always immaculately turned out, regardless of age and always sported comprehensive, fully working blind displays with via points shown, right until the later FLFs and VRs which had provision for ultimate destination and service number only. It was strict company policy that they must be correctly set too, the word ‘SERVICE’ would never have been allowed, in fact it wasn’t even on the blinds as an option. What is often overlooked regarding the BTC’s standard red and cream/green and cream ‘Tilling’ liveries is that when they were first introduced, the Tilling Group was in private hands. For many years the Group had operated a policy of centralised control and one of its aims, post-World War II, was to standardise on its ‘in house’ Bristol-ECW products – namely the K type double-decker in highbridge or lowbridge form, and the L type single-decker in bus or express form. Standard liveries for its bus fleets were also being pursued. When the Tilling Group was nationalised in 1948, outwardly it would probably have looked like ‘business as usual’ to the general public, as the old Tilling liveries remained. Interestingly, when the Balfour Beatty Group came under state control, Midland General, Notts & Derby Traction and Mansfield District retained their original liveries. Later, when the Red & White Group was acquired, Cheltenham District continued with its dark red and cream livery, applied in its distinctive fashion. The BTC did not seem to be as obsessed with rigid standardisation as perhaps the privately owned Tilling Group had been. Although many of the coaches in the BTC fleets donned cream with either green or red/maroon relief, some distinctive and well respected coach liveries continued – those of United, Royal Blue, South Midland, Bristol-Greyhound, and Crosville spring to mind. Presumably prestige and local good will still counted for something, even under state control. When the THC and BET Group were combined to form the state owned NBC in 1969, with the well-intentioned objective of halting the decline in bus use, for the first few years it appeared once again to be ‘business as usual’ regarding liveries. Ironically, it was someone from the private sector – one Freddie Wood – at the behest of the Heath government, who was responsible for the corporate liveries inflicted on the constituent companies in 1972. The standardised poppy red and white, or leaf green and white liveries for buses and ‘local coaches’ and the allover white National coach livery were not a patch on the liveries they replaced. In fairness, the introduction of the ‘National white coach network’ did improve public awareness of express travel and business did increase as a result, but why such an impractical colour was chosen for such hard working vehicles operating over long distances in all weathers remains a mystery. Midland General, together with Notts & Derby and Mansfield District, were Balfour Beatty companies. Balfour Beatty initially concentrated upon tramway operation in Nottinghamshire and Derbyshire, whence it then broadened its activities into electricity generation and supply in those counties. When the electricity supply industry was nationalised in 1948, that aspect of the Balfour Beatty operation was taken over by the government, but the three public transport components of the business, by then using trolleybuses and motor buses, did not automatically follow suit. The disposal of Midland General, Mansfield District and Notts & Derby was a decision taken by Balfour Beatty in the light of the then Labour government’s aspirations for public ownership of the bus industry. Tilling sold out at about the same time, but the BET resisted. I agree with Chris that the standards of Midland General were very high, endorsed by the splendid livery. The reason that the Midland General fleet could be so smart was that the services operated were extremely profitable compared with other operators such as Trent. Indeed so Nigel, Midland General had some very lucrative routes and on weekdays they operated many works and colliery services which operated throughout the day to meet changing shift patterns. On Saturdays, when vehicles which had been used on such duties might otherwise have stood idle, many of their principal services were so busy with shoppers, they were doubled in frequency, so the fleet was fully utilised. A blue livery and a blue chip company! Roger, the shareholdings of MGOC/NDT/MDT were all held by the Balfour Beatty subsidiary "MIDESCO", the Midland Counties Electricity Supply Company – it was MIDESCO which was nationalised as part of the compulsory nationalisation of the electricity supply industry, becoming part of the British Electricity Authority (BEA). It was because Balfour Beatty chose not to separate out the accounts for MGOC/NDT/MDT from those of the parent (MIDESCO) that they were nationalised (as part of that electricity supply company). Initially the BEA negotiated with a management agreement with Balfour Beatty for "oversight" of MGOC/NDT/MDT, but this lasted only months until the BEA transferred MGOC/NDT/MDT to the BTC. The Llanelly & District company ended up in state-owned hands for similar reasons, but the outcome then was quite different. A classic combination of AEC Regal III and Weymann body. Chassis number 9621E481 was combined with a 35-seat front-entrance Weymann body, M4122, and appropriate seating to allow dual-purpose use. Worthy of note is the ‘MGO’ badge replacing the more usual AEC triangle and also the additional chrome-work of which Midland General were so fond. For me, the blue and cream livery was enhanced by this additional, but tasteful adornment. This superb vehicle was caught at Showbus 2016. This Regal was one of a batch of twelve 174-185 with Midland General all of which were transferred from Mansfield & District in 1958. So it would have originally been in a Green and Cream livery and may of had a MDT badge on the grill and was fleet number 9, not sure if the chrome work is original or added by Midland General at a later date. There were some Leyland PS1s with similar bodywork placed in service by Crosville Motor Services which were diverted from Midland General. They have the same style of chrome work and more of it on the side panels. Photo 30 shows preserved LFM 302. Photo 31 of LFM 303 in quite a battered state after Crosville had sold it to a contractor. Mention is made of the MGO radiator badge in the picture of KRR 255. I attach an image of such a badge, as the picture does not show it off very well. From what I can make out there was the Midland General Group which included Midland General obviously, Mansfield & District and Notts & Derby. One thing I find strange is that they purchased Bristol manufactured buses I thought that after 1948 only nationalised bus operators could do that. 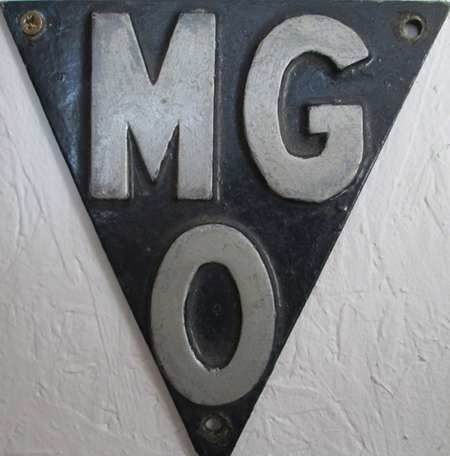 Although one thing I found out was that the general manager of the Midland General Group was also the general manager of the Lincolnshire Road Car Company which was a nationalised operator. One interesting point is that Midland General had their initials in place of the AEC badge on the radiator as can be seen in the blow up below. This is Mount Street bus station, Nottingham. This is a pre-selector, and as I remember, it was quite unusual for them to be used on the C5 (and B3) Alfreton routes – more usually the crash gearbox Regent IIs. Even up to the late 1960s when the main service was run by Lodekkas, Underwood depot used to turn out two or three Regent IIs on Saturday mornings when the service frequency was doubled. The transmission sound of a crash gearbox Regent II was sheer music. Strictly speaking, Balfour Beatty were nationalised because they were an electricity generator (for their Notts and Derby’s trolleybuses). They were handed over to THC/Tilling as a result of this. They would happily have continued with AEC/Weymann otherwise. I had to have a wry smile at the above comment, which is admittedly basically true I suppose. What many don’t realise though is that it didn’t have the equally revolutionary "Lodekka" body, but rather a modified version of the standard postwar product – recognition of this feature perhaps being eclipsed by the dramatic radiator and bonnet etc. Eventually joining West Yorkshire Road Car Co. Ltd as 822, it was renumbered with the rest of the fleet and ended its days as DX1. Ugly duckling it may have been, but it was the first practical model to abolish the awkward offside upper saloon gangway and poor headroom, and the notorious nearside leaning and rolling on cambers. The KSW’s mentioned were delivered to Notts & Derby as replacements for the BUT trolleybuses which came off service during 1953. The prototype Lodekka was never owned by the company but spent a while with them on a trial basis however this did start a long relationship with Bristol/ECW right through to the demise (almost) of the MGO group in the 1970’s. Indeed the very last Lodekka (YNU 351G) became part of the fleet in the Autumn of 1968 and after continued service with Trent passed directly into preservation in 1980 where it still is – I was one of the original owners. The Barton’s low bridge decker looks like one of there NCME Regent V with the wrap around front windows a very smart looking design. The most memorable thing about all of them was the astonishing condition in which they were maintained, some of them achieved almost twenty years service and they were always turned out in pristine condition right till the end. In their later years, there was a concentration of them at Ilkeston garage, for use on the frequent town services which involved a stiff climb up the main street with many stops and high loadings, a task which they performed with consummate ease, much better than a lumbering Lodekka! In fact, I think it wasn’t until the arrival of the semi-automatic FLF6LX Bristols that the management of MGO thought they had anything capable of replacing them. You are right about the RLHs Chris (which of course were actually diverted from MGO). Similarly, the Regent IIs which tend to get called STLs. Goodness – LT only had 20 of them. Plenty more went elsewhere, and they were about as different from proper STLs as chalk from cheese! As for the Ilkeston town services (A2 and A3) I seem to remember some of the N&DT KSW6Gs being used, in the early 60s, when they had been displaced by Lodekkas from the Nottingham – Ripley B1. I guess it was the pre-selector gearbox on the Regents that made them favourites with Bath Street hill to contend with in one direction and Nottingham Road in the other. 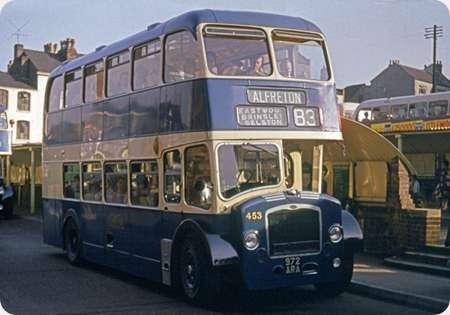 I hope I’m correct in this statement bur Bristol double deckers where not in service at the midland general until after 1957 to 1958…. I used to work at underwood garage 1973 to 76, and used to drive the old deckers both with Gardner engines and also with Bristol engines, these where brutes to the brain, left arm and the hearing at times when missing a gear the right leg also suffered due to the throttle being connected direct to the governor in the fuel pump. The LW and early LX series of Gardner engines had ‘all speed’ governors which worked by setting the maximum engine speed at a level determined by the accelerator position. Pressing the throttle pedal to increase the revs acted against the resistance of the governor setting, and resulted in a heavy pedal action. When changing gear upwards with a conventional clutch/gearbox transmission, it paid to blip the engine slightly to take the load off the governor once the gear had engaged before releasing the clutch again to take up power. This obviated the tendency to jerk when the throttle pedal gave way suddenly under foot pressure. Murray, you may be right so far as Underwood was concerned, but I think Langley Mill had Bristol Lodekkas earlier than 1957. I’m almost certain they were running on the Hucknall – Alfreton C9 by 1956 at the latest. And of course there were the 15 earlier Bristol KSWs, that were actually Notts & Derby rather than MGO, which came in 1953. Midland General’s first Lodekkas were actually delivered in 1954. One early use of them was on service 44, Derby – Chesterfield which had been instituted in that year and was regarded as a ‘flagship’ route so Alfreton garage may have had some of the first LD’s. Thanks for the link to the photos of prototype Lodekka LHY 949 John. Stephen’s earlier comments about the Lodekka prototype being a "strange and ugly contraption with a very wide exposed radiator" are, as Chris Y notes, basically true. However, if one looks at the ECW bodywork fitted to both prototypes, even though they were of differing styles, they were still quite attractive – as long as you didn’t stray around to the front end (Oooof!). It is well documented that the pair of Lodekka prototypes used some parts from the two prototype M-type chassis exhibited at the 1948 Commercial Motor Show. Intended as a beefed-up K-type with export markets in mind, the M-type was to have been available in double-deck (MD) or single deck (MS) form, and with either a Bristol AVW or Gardner LW engine, but it never went into production. Externally the main parts transferred over to the prototype Lodekkas appear to have been the wide radiators, chrome bumpers, bonnet assemblies, front mudguards and headlamps. The wide radiator did neither of the Lodekkas any favours, and the kindest comment I have read to date called it "ungainly". Considering the overall attractiveness of the bodywork, the ‘set back’ look of the cab in relation to the radiator, mudguards and bumper simply jars. Most un-Bristol/ECW-like. Going back to Midland General Stephen, the prototype Lodekka demonstrated to the Company, plus Mansfield District and Notts & Derby, was West Yorkshire’s 822 (JWT 712).